"The Gibson Brothers, the Mail Boat, and the Blizzard"
I fell through the ice different times but I mean, never had no problems. Put a car through the ice once. We don't get the ice on the river that we used to get. They used to drive cars right across from Morristown right to Brockville. Right across the river. Back before World War II, but since then the Seaway. The Seaway changed all the currents in the river, see. Now it's dangerous to go out there in a car. But years ago they thought nothin' of it. Everybody was harvesting ice and everything else with trucks and everything else. Donald and Herbert Gibson went over and they delivered their mail, and they had some to come back. They were told by the customs here it was a stormy day. don't go over, and they went over anyway. It was a stormy day in January, and they got over there, and they delivered the mail and they picked up some more and they would go back. They had walked over and then, for where the ice was open, they had their boat. But the Canadian immigration men said, 'Don't go. This is very bad. You shouldn't go,' and they warned them not to. But they said, 'Oh, no, no, we can do this.' So they had boxes of fish besides the mail bags. They was quite a lot of weight in their boat, and the river was fairly rough that day, when they come across. Later on we always thought when they come around the corner of the islands out there that a wave hit the boat and due to overloaded weight in the boat, the boat tipped over. Somebody found the boat later down on the shore. They found the oars and they found the mail bags and they found a box or two of fish that they were bringin' across. They found some of the equipment they had. I guess they found a life preserver, a gas can. There was different things they found, but they never found the two boys. So since, since that time people been reluctant to go out on the ice with cars or anything. They've learned the lesson around here to stay off the ice. 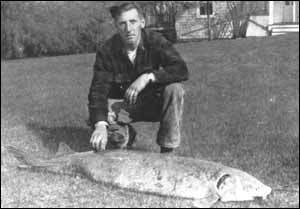 "The Day I Became a Muskie Fisherman"
Growing up around Massena during the Depression, there wasn't much for a kid to do. Nobody had any money, but we had three rivers comin' through there, the Raquette on one end of town and the Grasse on the other end, and they all empty into the St. Lawrence, five miles away from town. Therefore, that was something that we had to do was to play along the river. So we learned how to fish and how to swim and we spent most of our time around the water. One day I finally got enough money to buy a fish pole and I took the pole on my bike and I rode out to the St. Lawrence River, which is five miles to a place called the Massena Weir. There was an old boat layin' there on the shore at the head of the Long Sault Rapids, and I pushed the boat out into the water and I was goin' to try my luck fishin'. Well, I made two casts and the second cast I got stuck on the bottom, and then pretty soon the bottom started to move. And I was quite excited about that. So, whatever I had on my line came in on the reel, about fifty feet. After it got that far, I had no other choice but to jump in the river. So I jumped in and was holdin' on the pole with one hand and treadin' water with the other and downstream I was goin' with whatever was on there. So I finally pulled into a shallow area and I pulled the fish over to the shoreline and I looked and I couldn't believe it, because there was a big muskie and he was prob'ly about 56 inches long, prob'ly 45 pounds! So, I took a piece of driftwood and hit him over the head. I took my belt off and put it through his gills and I tied it to the handlebars of my bike and I pushed the bike all the way back, I walked all the way back to Massena. And he was draggin his tail on the ground. So, when I got back there, there was a bunch of boys on the corner there, and they said, "Look at Jim Evans, he prob'ly must've found a dead fish along the river somewhere!' Well, I knew I caught him, but the tail was completely gone from draggin' on the blacktop and, of course, the head was smashed in a little bit, sorta looked like I prob'ly did find it dead some place. But, anyway, from that day on, I decided that I was gonna be a muskie fisherman. 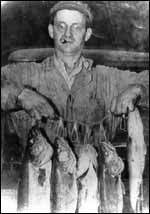 One of my fishing parties was two young surgeons from Allentown, Pennsylvania. They worked at the hospital there. And they came up here and went muskie fishing with me one November. We were out on the river, two o'clock in the mornin', and they were freezin' up pretty bad. And so was I, really. And they said, 'M-M-M-Mr. Evans, we g-g-g-gotta go home, we're f-f-freezin'!' And I said, 'We're not goin' home until we catch a fish!' So they soured, they laid right down in the boat to get out of the wind, and their poles were stickin' up over their heads. Pretty soon, about two passes later, one guy gets a strike and it was a nineteen pounder he brought in. So, now he sets back up in his seat and about another half hour later, the other guy gets a thirty one pounder. And he sets right up in his seat and says, 'Isn't this a beautiful night? This is really nice out here!' So, you see, when things are a little bit slow, people get discouraged. Well the best part of all that was, they went back to Pennsylvania and they showed off their fish and their pictures. The next day the phone was ringin' off the hook and, pretty soon, within a month's time, I took everybody in their hospital out fishin'. So, that's the way it worked out.